On Thursday, September 17th, students and faculty gathered in the Athletic Center to kick off another year of educational and inspirational Community Life presentations. 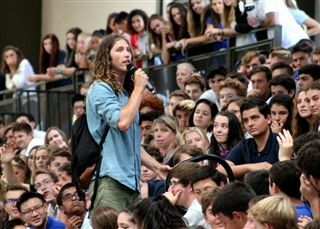 The year's first guest speaker was Jake Ducey, a 22-year-old motivational speaker and three-time author, who used his infectious energy and charismatic storytelling to encourage students to pave their own trail. At 19-years-old, the La Costa Canyon alumnus set off for a six-month solo backpacking trip around the world. His adventures and misadventures in Guatemala, Indonesia, Australia, and Thailand helped cement his purpose - encouraging others to follow their hearts - and inspired him to write his first book. Jake spoke of the many obstacles he faced on the path to success, and taught students how to handle rejection with optimism.